In order to process payments with Visa and MasterCard credit cards, we now need an additional element: Visas Card Verification Value (CVV2) or MasterCards Card Validation Code (CVC2). The CVV2/CVC2 is a three-digit security code that is printed on the back of credit cards. This code is used to establish that you are in possession of the card used for the payment. 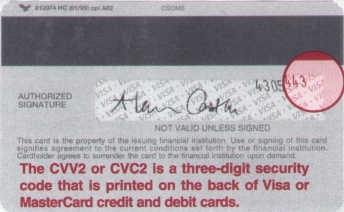 The three-digit CVV2/CVC2 number is printed in reverse italics on the card signature panel on the back of your card. Usually, it is preceded by the last four digits of your card number.